Able Seaman Orchard was assigned to HMS Duke of Wellington twice during his service with the Royal Navy. The first occasion was, as has been mentioned before, when he was signed off from HMS Daphne on 25th May 1870. HMS Duke of Wellington's Victualling List for the period 1st July to 30th September 1870 shows that Ordinary Seaman Geo. Orchard was victualled by the ship as a 'Supernumery Disposable'. This means that he was not actually a member of the ship's complement, but he must have been on board the ship, or one of her tenders, as she was feeding and providing for him whilst he was awaiting permanent posting to his next ship. The List shows that four other ex-members of Daphne's crew were also attached to the ship, namely AB's James Peters and Henry Baldwin, and Ordinary Seamen Stephen Dubber and Stephen Churcher. George Orchard was borne on the Duke for 42 days for victualling purposes, being charged a total of £2 2s, and then was discharged to Achilles. None of his former crew-mates came with him. 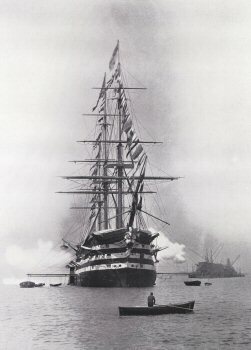 In 1869 HMS Duke of Wellington had replaced HMS Victory as flagship at Portsmouth, a role which she played until 1891, and her main duties were mainly ceremonial, as several Log Book entries record the firing of salutes to passing dignitaries, including at times Queen Victoria on her way to or from Osborne House. The ship had been originally named HMS Windsor Castle, but because she was launched on the day the Iron Duke died, she was immediately renamed in his honour. She was one of the last wooden-walled ships to be built, and it has been calculated that 76 acres of trees were felled to provide the timber. During construction, her hull was sawn apart and an extra 20 feet was inserted so that the machinery and boilers for a Robert Napier steam engine, driving a screw propeller, could be fitted. When built, she had been armed with 131 guns of various calibres, but by 1874 this had been reduced to 13, and these were used only for drill, signalling and saluting. The Duke had been Vice-Admiral Sir Charles Napier's flagship in the Baltic during the Crimean War, and her crew had seen successful service ashore in capturing the fortress of Bomarsund. Her Naval service finally ended on 12th April 1904, when she was sold. The second occasion on which George Orchard was attached to the ship was after the Achilles had signed off her crew, on 21st March 1874. Unfortunately, Musters and Victualling Lists for Duke of Wellington have not survived for this period, and so it is only speculation as to whether or not George actually served on board the ship. His number on the ship's books, according to his Continuous Service record, was 561, and this would indicate that again he was a 'supernumery'. However, as it turned out, George Orchard's Naval Service was not to continue for much longer, as around the time that he joined the ship, he was involved in an accident which was to lead to his discharge from the Royal Navy. There is no entry in the Duke of Wellington's Log to indicate that an accident occurred, although there are possible references to an incident on the ship, in that on 28th April a funeral party was sent to the Haslar Naval Hospital, and on 5th May, it notes that the ship 'received recovered men from hospital'. George Orchard was probably not amongst them, as his Continuous Service Record notes that on 8th May 1874 he was discharged from the Service. The entry shows that he was invalided out through Haslar, the cause being his 'latest accident'. He had served for one day less than seven years.